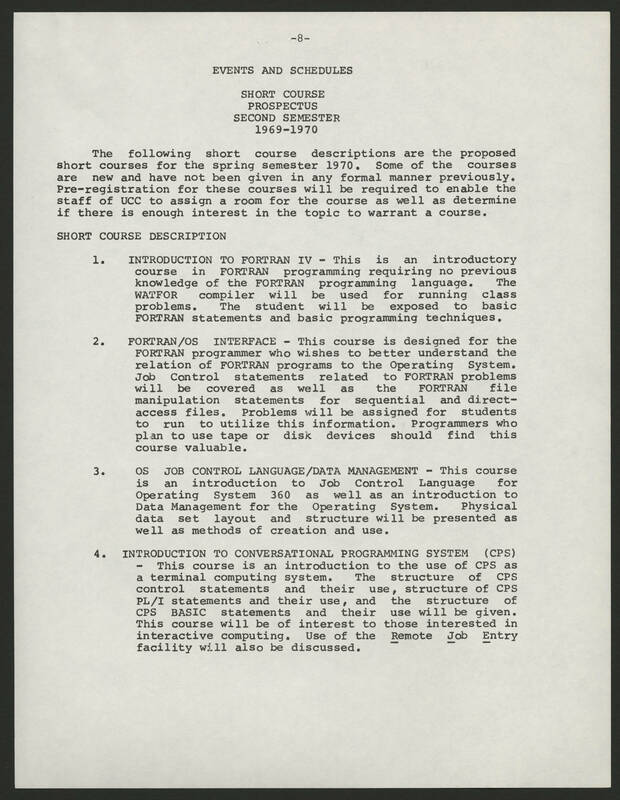 -9- EVENTS AND SCHEDULES SHORT COURSE PROSPECTUS SECOND SEMESTER 1969-1970 The following short course descriptions are the proposed short course for the spring semester 197-. Some of the courses are new and have not been given in any formal manner previously. Pre-registration for these courses will be required to enable the staff of UCC to assign a room for the course as well as determine if there is enough interest in the topic to warrant a course. SHORT COURSE DESCRIPTION 1. INTRODUCTION TO FORTRAN IV - This is an introductory course in FORTRAN programming requiring no previous knowledge of the FORTRAN programming language. The WATFOR compiler will be used for running class problems. The student will be exposed to basic FORTRAN statements and basic programming techniques. 2. FORTRAN/OS INTERFACE - This course is designed for the FORTRAN programmer who wishes to better understand the relation of FORTRAN programs to the Operating System. Job Control statements related to FORTRAN problems will be covered as well as the FORTRAN file manipulation statements for sequential and direct access files. Problems will be assigned for students to run to utilize this information. Programmers who plan to use tape or disk devices should find this course valuable. 3. OS JOB CONTROL LANGUAGE/DATA MANAGEMENT - This course is an introduction to Job Control Language for Operating System 360 as well as an introduction to Data Management for the Operating System. Physical data set layout and structure will be presented as well as methods of creation and use. 4. INTRODUCTION TO CONVERSATIONAL PROGRAMMING SYSTEM (CPS) - This course is an introduction to the use of CPS as a terminal computing system. The structure of CPS control statements and their use, structure of CPS PL/I statements and their use, and the structure of CPS BASIC statements and their use will be given. This course will be of interest to those interested in interactive computing Use of the Remote Job Entry facility will also be discussed.